There's nothing like sharing that first moment together. I'm sorry ours was so rushed, Lily. Really? I wouldn't change a thing. Rowan tilted his head and looked down at Lily. He opened up his heart before he kissed her so she could feel his love as clearly as she could feel his lips. Love is willing to become the villain so that the one you love can stay a hero. Lily stared at a map of what she still thought of as North America, except in this version of the world, North America ended just a little past the Mississippi River. Everything west of that was filled in with nondescript cross-hatching, as if to say, Here, There Be Dragons. Which, Lily supposed, was entirely possible. This book, you guys. No . . . this series. I'm not a big witch person, but the way Josephine writes her witches is nothing short of magical. (See what I did there? I'm sure you did - this is what I get for writing a review at 7:00am before coffee.) These witches aren't casting spells, per se. They're using the elements and things around them in sort of a scientific way. There is a magical element about how they do things, but they're not necessarily pointing their fingers and saying magic words. When I finished Trial by Fire I knew I had to start Firewalker right away. That ending! Oh gosh. Luckily, Josephine picks up exactly where she left off and we see Lily's long recovery from the Pyre, Rowan adjust to this version of Salem, and the aftermath of Lily's three month long disappearance act. During her recovery, Lillian visits Lily a few times and shares with her some memories in hopes to get Lily on her side and to explain why she did what she did. There are definitely instances where Lily, on some level, understands Lillian's point of view. I am still a huge fan of how Josephine writes these two characters. Much like in Trial by Fire, they're the same but they're not. Lily comes to a point where she knows what she must do but adamantly refuses to fall in line with Lillian's thinking. Definite parallels between the two characters but they still remain individuals. Lily's character grows even more during the events of Firewalker. With Rowan's helping she is becoming a stronger witch and in effect a stronger person. And speaking of Rowan *swoon*! The relationship between these two is sweet and loving. I just want to lock them in their own universe where this is no Lillian, no Alaric, no other mechanics, and just them. That's it. Just these two crazy kids being in love and that's that. End of story. Yea! But let's be real. This is book two of a trilogy so things aren't going to be all sunshine and puppies. (Come on Traitor's Pyre - I'm rooting for you!) Josephine weaves a wonderful story that keeps you turning the page and atching these two worlds collide into one in a way I never thought of really shows the genius and creativity that lives within Josephine's mind. 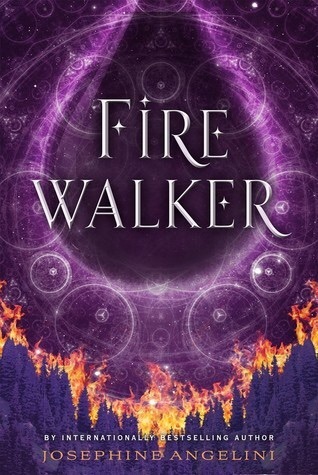 I already fell in love with this series upon finishing Trial by Fire, but Firewalker just cemented itself as an all time favorite. With ever evolving characters, new dangers around every turn, and a heart stopping romance, this is definitely a series you're going to want to get in on!